Matt talks Warhammer 40,000: Regicide with project lead Cathrin Machin and community manager Thomas Holdsworth from Aussie studio Hammerfall Interactive, ahead of the game's Early Access launch. 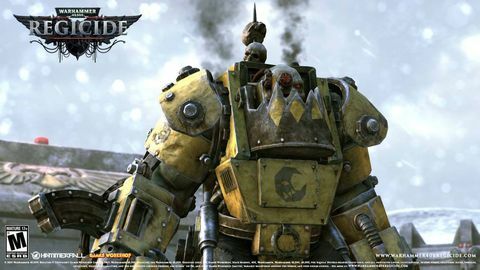 Q: What is Warhammer 40,000: Regicide? Cathrin Machin: Regicide is an intense strategy game that combines concepts from one of the most successful turn-based games of all time with the Warhammer 40,000 universe. The game's Regicide mode includes psychic powers and abilities mixed with chess mechanics – all played out with brutal animations. Q: How did the studio come together? 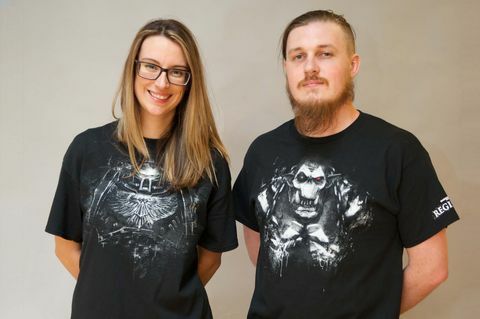 Cathrin Machin: We are long-time Warhammer fans, and we were inspired by things like Interplay’s Battle Chess years ago. It’s an idea we’ve been speaking about for close to five years – it’s not something that came up overnight. We felt the brutality of the Warhammer universe and the tactical elements of a small tactics game would work so well together. We didn't want to make a standard chess game, but instead create an aspect of the Warhammer universe. Regicide is part of the Warhammer lore. It featured in Dan Abnett novels, and Nick Kyme’s novels as well. Thomas Holdsworth: Kyme wrote a story based on a game of Regicide going on between two characters (Imperfect). Cathrin Machin: The game is part of the lore anyway, but it’s something that probably only diehard fans would know about. Our game is not a verbatim copy, as it’s described in different ways, both on a galactic level and smaller-scale. Q: How did you manage as a brand new studio to score a Warhammer license from Games Workshop? Cathrin Machin: It was all about putting forward a really solid plan and pitch. It was something we worked on for a long time, and we were very grateful for them to accept us. Q: What can you tell us about the story? Cathrin Machin and Thomas Holdsworth. 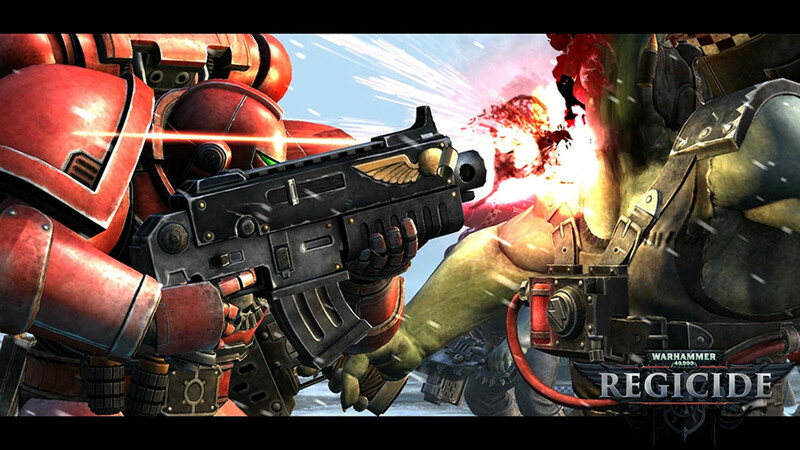 Thomas Holdsworth: The story is centered around the Blood Angels chapter of the Space Marines. 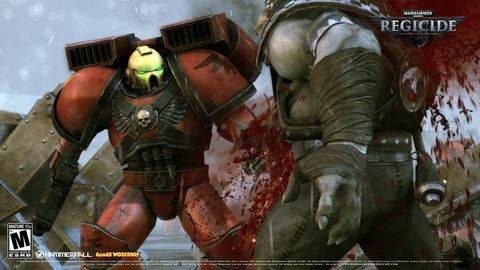 We are being fairly quiet about the content of the story, but we are foreshadowing in the trailer that it’s a little more psychological than Warhammer 40,000 stories in the past. The nature of the game is the violence is a little more personal, and everyone is closer together. Rather than squads, it's face-to-face. We’re getting a bit more personal with the story as well, that’s something that’s important to us. Without giving too much away, that’s what you can expect. Cathrin Machin: The video log you’ve seen is actually… there’s some preamble which is secret, but this is the video log from an orbital station parked above a planet called Hethgar Prime. Obviously a lot of things go wrong. It’s really hard – I’d love to tell you everything, as there’s some really interesting twists that come into it later on. We’re working with [40K author] Ross Watson. 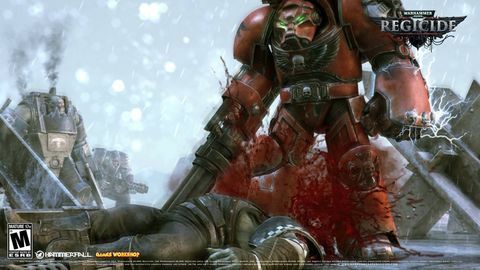 It’s going to be split into different acts, and it’s all going to be narrated by Brian Dobson [the Dawn of War series]. It’ll be an interactive storybook with these puzzles and missions in-between the pages. Q: So how does Regicide mode differ from regular chess? Cathrin Machin: You have various pieces which move in a similar way to chess pieces, but that’s where the similarities end. Once you’ve moved your pieces into place, you get a pool of initiative points which allow you to use abilities. There are two types of those. Each unit has certain abilities such as 'go to ground', snapshot, and grenades. Your kings will have special ones: they can bring in airstrikes, and inspire their troops through something like Rally Cry, for instance. Each unit has four to five abilities, and the player has 12-16 depending on race. We class these player abilities as 'off board' abilities. They’re tech and psychic abilities that you can cast to add flavour to everything. Every unit has wounds, armour, toughness, weapon skill, weapon strength, and so on. All of these you can balance differently depending on what race you’re using. For instance, an Ork is more deadly at close combat but more inaccurate when shooting. Q: Chess is an incredibly well-balanced game. How did you approach game balance in Regicide mode? Cathrin Machin: Like with the tabletop game, you have requisition points to bring in units at certain times, so you aren't necessarily starting in a standard chess formation. So, a lot of the balance things are done by the player. Thomas Holdsworth: The game is much less balanced than chess. It is an asymmetric game, and what you bring to the table will affect how it pans out for you. If you apply resources to your front line, your rooks, and your heavier gun units, then you’re going to be able to play a much more defensive game that’s less dependent on actual 'development', to use a chess term. Getting pieces out – ranked-up knights and so forth – you can play a riskier game. that’s something chess players probably aren’t used to – not being sure what the outcome of their actions is going to be. But it allows us to deal with one of those things in chess - the concept of opposition, where you’re almost stuck with only one possible move to make. In Regicide, you’ve pretty much always got a couple of ins and outs in any situation. That means the battle is going to ebb and flow much more. You can end up in situations where you’ve only got a couple of pieces left on the board, and as a heroic last stand, all of your resources are pumped into those units. That means they’re going to be much better equipped and can battle up to three or four times their number – at least for a short time. If you can claim your victory condition in that time, you might just pull out a win, whereas you would never see anything like that in chess. Q: What are the game's victory conditions? Cathrin Machin: We have totally different victory conditions depending on how the level is set out, and these become a bit more apparent as the campaign rolls out as well. For instance, rather than just a checkmate objective, you might need to kill a certain number of units, capture a particular piece, or protect a particular square. There are capture the flag elements that can come later on, as well as activating beacons on particular squares. The way the AI plays is very different. We can have a mix of objectives too, so my objective may be to secure a locator beacon, whereas my opponent needs to kill a unit of mine that’s carrying a message. The way you play changes dramatically depending on what those objectives are. On top of that, every element of the grid can be a destructible blocker. There’s also mines, and some squares have properties such as healing or additional cover bonuses. Q: Will there be time limits on a player's turn? Cathrin Machin: There’s obviously different types of speed chess. It’s still in development but we’re trying a few different methods for getting that right. Q: How long does an average game take at the moment? Cathrin Machin: It’s sitting around 30 minutes for a game, plus or minus 10. Q: You've announced Blood Angels and White Scars on the Space Marine side, and Goffs and Bad Moons on the Ork side so far. How many factions will there be in total? Cathrin Machin: We have 11 factions split between Ork and Space Marine, and that’s just a starting point. We have an additional race that’s revealed at the end of act three of the campaign. Q: Why did you opt for an Early Access launch? Cathrin Machin: We want to give a voice to everyone that’s playing the game, to do things like give suggestions on what factions they want to see next – we’re looking to the community to guide us as far as what they want to see in the game. We want to link the factions with small mini-campaigns too, although not every faction will have one. For example, we’ve been speaking with [Warhammer novellist] Graham McNeill about an Ultramarines campaign, which is in progress at the moment. 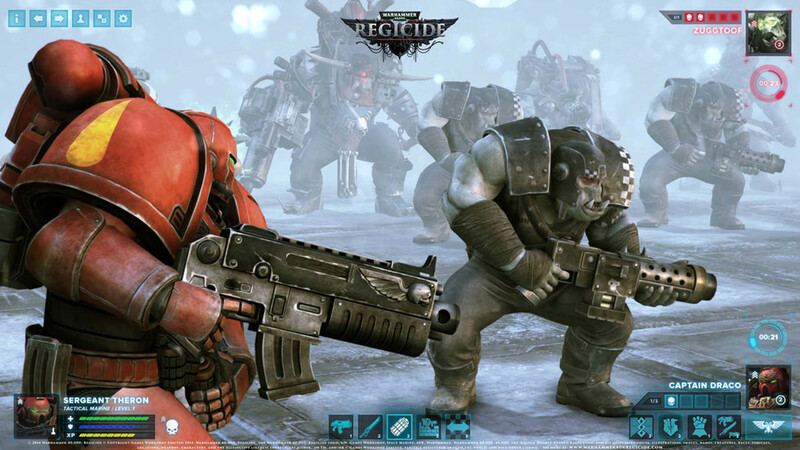 Warhammer 40,000: Regicide hits Steam Early Access on May 5. Prime candidate for a Viscera Cleanup Detail DLC.